Once got to a stage where all the unwanted plants, weeds, trees were gone and I was left with a flat piece of bare earth, it was time to work out how I wanted my new garden to look. I had visions of me sporting a safari hat and holding a machete knife, hacking through ten foot tall ferns with howler monkeys and cicadas shouting from high up in the canopy. As my tropical garden only measures twenty foot square, I’m perhaps being a little over ambitious. However, do I want to at least feel like I’m not seeing the whole garden from the entrance and I want to have to push my way through the foliage to get to the other side. Which brings me to my next point, features. Once I have my postage stamp jungle up and running, I’m going need to have a reason to explore it. So the first thing I wanted was a pond so the local wildlife have a place to drink, frogs have a place to do the backstroke and I have a nice feature to put at the end of my safari. I also had a huge pile of logs and branches from the Leylandii and Apple trees to do something with. 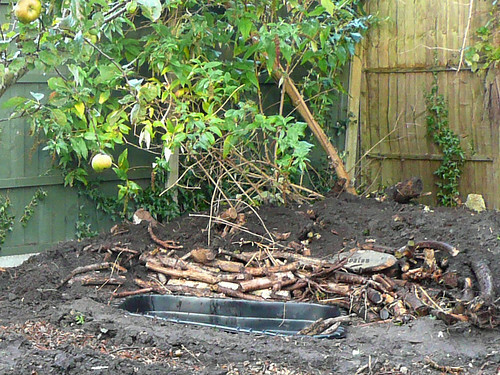 My plan was to dig the pond, surround it with the logs and using a method called ‘Hügelkultur’, create a raised section of the garden by covering the logs with the mud from where the pond had been dug out. 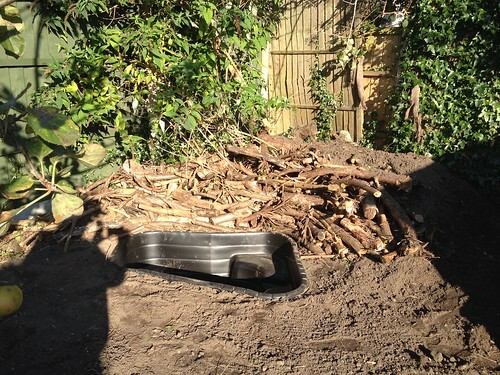 It’s my first time using Hügelkultur, which is meant to be a great way to create a fertile, water retentive area which has the added benefit that it creates heat as the logs slowly decompose. It’ll be great for any tender plants I choose to plant on top of it! 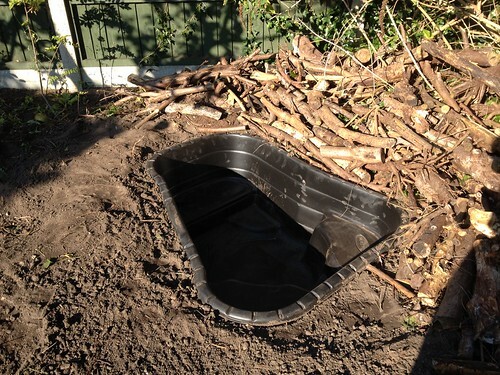 I bought a semi-rigid style pond out of ease as I’ve used pond liners before and unless you remove every stone and line it with blankets or sand, it may get damaged. So a rigid one it was. It doesn’t look much now agreed but once plants start overhanging the pond and the raised area is covered by wonderful ferns, hostas and cannas, it’ll look amazing – honest!